Thank you for visiting my website! You have absolutely come to the right place. At any time if you would like to speak with me directly, please call my office at 831-645-1160. You will be connected to me immediately or asked to leave a voice mail if I am unavailable. You can count on my return phone call! That is a guarantee. 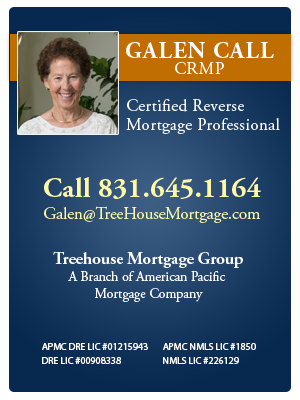 I am a Certified Reverse Mortgage Professional, serving California locally at Treehouse Mortgage Group on the central coast’s Monterey Peninsula. We are a branch of mortgage bank, American Pacific Mortgage Corporation in Roseville, CA. I am also the Manager of the Reverse Mortgage Division at Treehouse Mortagage Group. I have originated reverse mortgage loans since 2006 and I have been in mortgage lending since 2003. Today, as we emerge out of these economically challenging times, I view the reverse mortgage more than ever as a financial tool providing positive, solution based results. Retirement planning might include supplemental income, downsizing using a reverse mortgage purchase loan or exploring the opportunity to pay off a current mortgage and eliminate monthly payments are but a few of the ways this mortgage could help you. It is a fantastic option for multiple reasons! Contact me for more information and ideas. My focus is on you and on providing education for my clients, their families and their fiduciary’s. I believe in collaborating with like minded professionals whose only interest is in their clients well being; your Realtor, Tax Adviser, Financial Adviser or Attorney, regarding a reverse mortgage for refinance or purchase. This option is excellent when considering cash flow, debt relief or asset management. In my community volunteer time, I have served since 2008 as a Board Member for The Alliance on Aging, also as past President and Vice President. This 40 + yr old nonprofit organization provides Monterey County’s senior population viable programs which foster healthy living. I make personal time for recreational activities. I love being outdoors and I include early morning visits to the gym for yoga or spin class. Staying fit, actively meeting new people, being outdoors playing tennis, skiing, hiking and the occasional back pack trip, with family and friends, allows for a balanced life. Aging gracefully is a mantra and having fun on the journey continues to be an aspiration.